Note: Rousing music from the film Gladiator kicks in. Deep manly voice…. ”This was to be a great day, a day to go down in the Plot 23d history books. With the day booked off from work, the van loaded with tools and a rucksack full of treats purchased from the bakery (shhh.. don’t tell Soph!) I was a man on a mission. To create, to build, to protect all seedlings and bring new found warmth to all things growing.Today the polytunnel would rise from the ashes and stand as a beacon of prosperity. Down to business. Over the last few months I’ve done a fair bit of research on the polytunnel, studying the pros and cons from the cheapest to the deluxe. For me it came down to this: what do I want to grow in it and where would it reside? As I was going to use it on the allotment, I wanted something sturdy but inexpensive. It’s easy to opt for those sculpted works of ‘poly art’, but at £300-£400 a pop, I would almost be too nervous to leave it out in the rain! I wanted something with a sturdy frame that wasn’t so expensive that a fellow-gardener might relieve me of it under the cover of darkness! Besides, I thought that if this growing season does turn out to be a disaster in the polytunnel, then at least I can soothe my gardener’s pride by reassuring myself I didn’t spend too much. Happy with my reasons, I began the online search and after losing hours of my life to the interweb, I came full circle and ended up back at the first website I looked at: Amazon. Free delivery, best on price and full of great reviews, I paid my money and let my imagination bask in the potential polytunnel glory of growing the largest aubergines this side of the Thames. On the plot with my 30kg box of polytunnel bits, despite having the minimal of instructions, the thing looked fairly straightforward to construct. Even on my own, although they do suggest it’s a two-man job, I didn’t struggle too much. With everything anchored, I covered the frame arches with anti-hotspot tape and then spread the cover over the frame, which turned out to be a little more tricky. As those frugal instructions had advised me: ‘Ideally this is a two-man job and shouldn’t be attempted on your own.” Nevertheless, with the cover on I took the skirt of it and sank that into the trench and then backfilled. 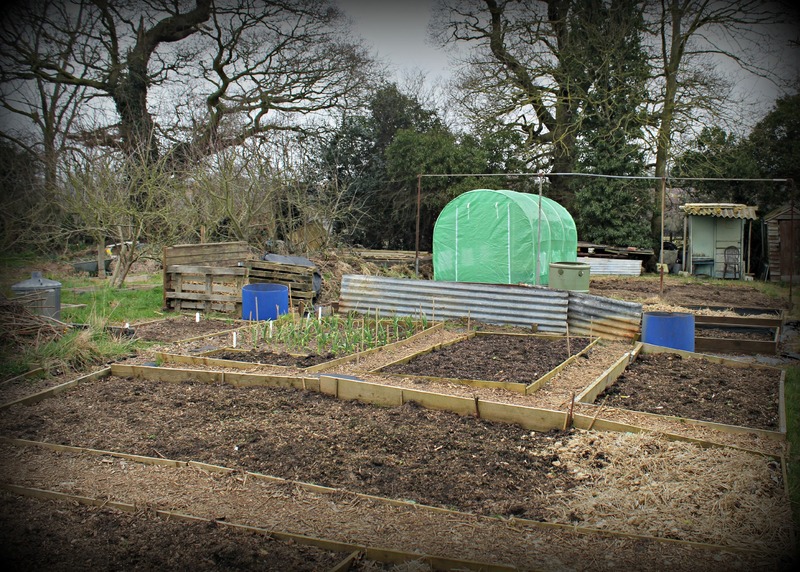 To finish off, I laid heavy-duty woven weed-control landscape fabric for extra insulation and to prevent slugs and bugs coming up from the ground. Job done! A two-man job? Not when Agentus Adious is on the case. Well done! I look forward to hearing how it works out. Good luck! Congratulations! I am so pleased for you! How sad that a fellow gardener could not be more supportive, we all need to do everything we can to encourage more people to do what you are doing. You are going to have such fun now you have the tunnel and you can get started with it straight away. I would love one, but am not allowed to put one up as I live in the Dartmoor National Park. As for wind damage, it is so exposed here that it would never survive. The wind would break panes of glass in my previous aluminium greenhouse, even in the summer. In the end, I had to get a digger in and dig right down and then build a wooden, dwarf wall greenhouse. What I would like is for your produce from your tunnel to be so abundant and fabulous that the old boy who made the nasty comments is just astounded! Thanks Derrick. Just checked out your link, some lovely photos there! Congratulations! Great job with the construction. Not getting back to the green tunnel until Saturday? Take a little bell with you and ring before entering. You may find a family of homeless have discovered the classy empty solar home and moved in. It’s lovely-well done. As for wildlife moving in I lifted the lid on my compost bin a few days ago and something huge and brown shot out from under the base. I guess it was a rat by the speed with which it legged it but I may never be able to lift the compost lids again. I could do with some of that hot-spot tape for the greenhouse I put up last weekend. Anyway, I know that feeling of researching for just the right thing, as I did the same. And came to the same conclusion as you. I’m sure your poly-tunnel will be fine. The greenhouse has already withstood some very blustery weather. I’ve weighed it down with bags of compost and gravel and that seems to be keeping it upright and on the ground.